KEBAB shops can be found almost everywhere today. Generally offering a good size meal for great value, it’s no wonder kebabs are so popular amongst students. But if you’re lucky enough to study in Turkey- the kebab’s ancestral home, you’ll quickly find that there are many other tasty street foods available. The exciting whirlwind city of Istanbul is home to some of Turkey’s best universities, such as Sabancı, and Istanbul Bilgi and Boğaziçi, as well as some of the most appetising street foods at affordable prices. Many of Turkey’s coastal cities boast mouthwatering fresh fish restaurants, vendors of grilled corn on the cobs and popular rice stuffed muscles. Having been to Istanbul on a number of occasions, I’ve had the opportunity to have a bite of the many different types of foods available. One thing I’ve always loved about Turkish street food however, is not only the aromatic smells of herbs and spices, but the experience which comes with the food. The vibrant culture of Turkey and the country’s love of food is fused with the food preparation process, and you always get to see how your food is made. Gözleme is a savoury traditional Turkish pastry dish, very similar to a pancake but with the options of most often a goat’s cheese, onion and spinach filling or spiced minced meat. 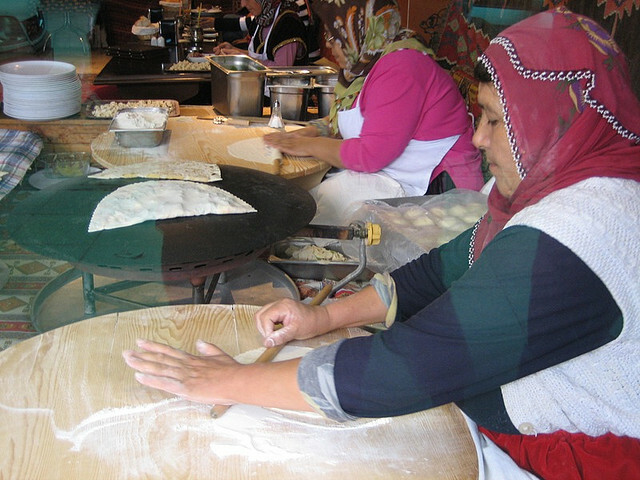 You’ll often see women sat down rolling out dough on a traditional wooden tableside, cooking the gözleme over a hot griddle. Gözleme’s are not only very tasty and super addictive, but cheap and healthy. They can be eaten for breakfast, lunch or throughout the day as a snack. The Simit is another pastry based option, and a staple of traditional Turkish street food sold by street vendors. The Simit is a light and flaky dough formed into a large ring, topped with sesame seeds and baked a golden brown colour. It can be eaten by itself or as a breakfast food with some jam. One thing that always goes very well with a Simit is a nice hot glass of çay (Turkish tea). For those who prefer a meaty, more adventurous option, you might want to try Kokoreç, although you may find it slightly unusual looking at its ingredients. Spiced offal is wrapped in lamb’s intestine and skewed on a large open fire until crisp. Popular in many Turkish cities and especially amongst students as a post-party snack, many claim it to be very tasty, and having tried some Kokoreç myself I’ll admit it’s not bad. However taste aside, it is very greasy and there have been concerns about the exact contents of the offal mixture, as well as questions about it’s health benefits as Turkey doesn’t have very strong food standard requirements. I wouldn’t recommend eating Kokoreç everyday. Ayran: A very popular savoury plain yogurt based drink. Çay: Turkish tea, served everywhere in Turkey in small dainty glasses. Maraş Dondurma: A very popular ice-cream originating from the eastern province of Maraş. Famous for it’s elasticity, vendors often offer a comical show which gets people laughing. Midye: Mostly found in coastal areas, Midye is a rice stuffed muscle. Very cheap and very tasty. However again there are questions of food hygiene. I originally wrote this article for Student World Online.